Staff Photo by Dan Henry Tony Ruiz, co-owner of El Meson, stands at the company's newest restaurant location that will be opening in the Northgate shopping complex in Hixson. El Meson, a fixture among eateries in the Hamilton Place neighborhood, will now serve its south-of-the-border fare in Hixson with the opening of a second store in the newly renovated Northgate MarketPlace center near Northgate, once home to Target. Scheduled to open the first week of September, the eatery will add a new dynamic to dining in the area. "There's no Mexican (restaurant) really close, so this is a great location for them," said leasing agent Tom DuPre with Cumberland Realty. "There's a lot of development around and behind the center. It's a growing market. And it's a convenient place for people who work in the area and they're short on time and need a quick lunch." The Ruiz family, father Raul Ruiz and his five sons, Tony, Raul Jr., Alberto, Edgar and Oscar, opened El Meson at Hamilton Place 17 years ago. Last spring, they signed a lease for the Northgate property, feeling the time is right to make the move north of the river. "Our customers kept asking us to come to Hixson," Tony Ruiz said, so they bowed to pressure and began construction on the new, 5,000-square-foot restaurant in July. The eatery will have the same menu as its sister restaurant, but the look will be updated with vibrant colors. High arches separate the dining quarters from the large bar area. All furniture was handmade in Mexico. "It will look a little more modern than our other restaurant," Tony Ruiz said. "We're thinking we may want to open more restaurants in the future, so this may be our new look." The restaurant will seat about 150 diners, smaller than the one at Hamilton Place, but Tony Ruiz said the small capacity will be easier to run and still be a moneymaker with less overhead involved. The Ruiz clan prides itself in the quality of food it serves. Many of the dishes use recipes passed down from the family's roots in the state of Jalisco in Central Mexico. "Our family has always been in the restaurant business," Tony Ruiz said. "My grandmother used to cook and sell food out of her home. And my aunt -- we called her 'Enchilada.' She made the best enchiladas around." 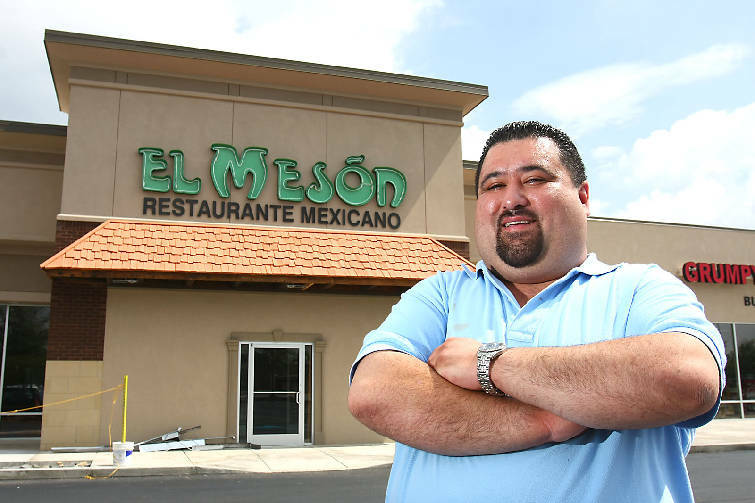 The center in which El Meson is located is off busy Highway 153, but Tony Ruiz said he thinks there is enough traffic around Northgate Mall to support their venture. Plus, said Pointe General Contractors' Kenny Reeves, superintendent of construction for the project, "with El Meson's reputation for good food, people will be looking for them."